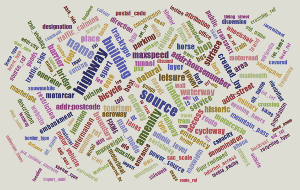 There are many tools that help with quality assurance in OpenStreetMap and they come in many flavours. One popular class of these tools are web sites showing the OSM map in the background and (usually switchable) overlays with markers for different types of problematic OSM data. They usually allow you to jump directly into the OSM editors to fix the problems. The most prominent of these tools are Osmose, the OpenStreetMap Inspector, and KeepRight. But there are many more of these, often written for very specific use cases. All of these tools have the drawback that they are “closed systems”: The person developing the tool and/or running the web service decides which layers there are. The creation of those layers is often tied more or less closely to the tool showing the layers. At the recent Karlsruhe hack weekend I released a new tool, Osmoscope, of that same class, but with much more openness built in. The Multipolygon Fixing Effort started a few weeks ago is going well. An amazing amount of work has already been done, but there is a lot more to do. I have started a blog (sort of) specifically to document what is happening with that effort. See you there! There are a lot of (multi)polygons in OSM that are broken in one way or another. And we have to fix them. While some of the broken ones appear on the map just fine, some don’t appear and some mess up the map. And some of those that appear fine on the main OSM map will not show up on other maps where different software is used. I am busy preparing for two events: Only two days now until the State of the Map 2016 in Brussels, where I’ll be giving a talk about taginfo. On Sunday I’ll be hosting an Area Workshop where we want to talk about the effort to fix broken and inefficiently tagged (multi)polygons in OSM. I’ll be around for (part of) the hack day, too. The most requested features of taginfo is a view showing historical use of tags. I never had the time to add this, but fortunately there is now a solution: Martin Raifer created a service that shows the history of tags in nice graphs. You can see it at taghistory.raifer.tech. Some more background in a diary entry from Martin. Matthijs Melissen has already used this to find some interesting statistics. Only one week before SOTM-US starts. I’ll be there giving a talk at the conference and a workshop on hack day. Hope to see you there! Last week I gave a talk about taginfo at the FOSSGIS 2015 conference. Thanks to the amazing video team all talks from the conference are available online in great quality. As always you can find my talk on my Talks page. Taginfo has the “mission” of aggregating all available information about OSM tag usage and present it to the users. The main sources of information are the OSM database and the documentation in the OSM wiki. But there are many more sources of information to be tapped. Everybody who creates a map, or writes presets for an editor, everybody writing a data export program or a routing application has to decide which tags to use in what way. All this is useful information, but it is hard to come by. Everybody uses different programming languages and different config file formats. And all this “stuff” is spread out over many software repositories and web sites. I spent a few days working on taginfo again. I fixed some bugs and refactored code here and there and added a heap of new features. Next week the (German language) FOSSGIS-Konferenz takes place in Berlin. For the first time since 2007 I am not giving a talk there, but I’ll be around all three days to learn new things and (re-)connect with people from the OSM and Open Source GIS communities. Lars Lingner and I are also organizing a BoF session for freelancers. We both are have been seeing more and more interest in OSM and GIS development and services and are often contacted for projects larger than one person can handle or where different skillsets are needed. We want to better connect the freelancers in these fields to to able to help each other out. So if you are working freelance or have a small company in the OSM or Open Source GIS fields, please come join us on Wednesday for a chat. In October 2010 I introduced taginfo. Since then I have updated it occasionally and added new functions. And over time it has become part of the “OSM landscape”. A few weeks back I gave two talks at the State Of The Map 2013 conference. One about Osmium, the other called “Towards an Area Datatype for OSM”. The slides and videos from both talks are now available on my talks page. Thanks to Peter Barth for “liberating” the videos from the 8 hour long flash-only videos put up originally. A map and routing service for the Kathmandu public transport system. And how the data was collected. This is why I love OSM. It is high time I’ll write something about the status of the Wikipedia Multilingual Maps project I have been working on for many months now. Yesterday Development Seed/MapBox announced that they received a grant of $575,000 to “improve the core infrastructure of OpenStreetMap”. This is a great development. We do have a lot of problems and there are many things that can be improved. 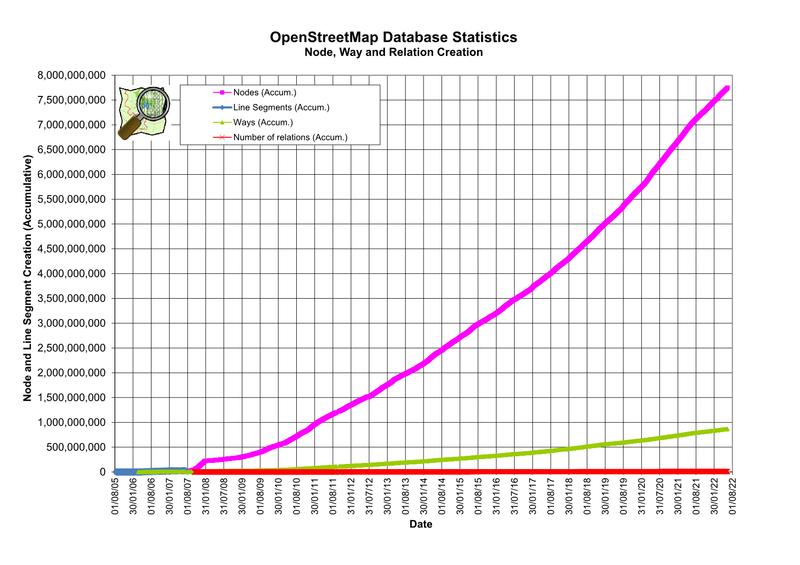 The community has been working on all of these things over the years of course, but I do think that we lag behind the growth curve of OSM and any help is appreciated. A while ago I wrote a small QGIS plugin, to control a running JOSM or other OSM editor that supports the remote control API from QGIS. I finally got around to add it to the official repository so that you can now install it with a few clicks from inside QGIS. After setting up the MapQuest Render Stack and poking around in its code I consider using it for the Multilingual Maps project. Unlike Tirex it can run on a cluster of machines for reliability and load distribution. That will be important for a tile server working on “Wikipedia scale”. Whatever way we’ll develop for rendering the multilingual tiles, we have to get the information about which language(s) the user wants from the user to the tileserver. Web browsers typically support the selection of an ordered list of preferred languages. This list is sent through the Accept-Language header to the web server. We could use this setting to determine the language for the labels. But in some situations people might not know about this setting or can’t change it. Maybe they are sitting in an Internet cafe in a foreign country. In that case it might be easier for them if they can just change the language setting on the web page. This is especially interesting if the web site knows which languages are available and only shows those options. 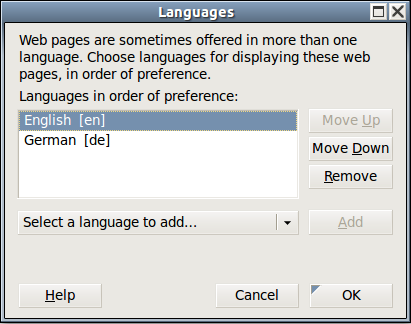 The browser setting doesn’t know anything about actually available languages, it just has one large master list. If we want to render multilingual maps by separating the “label layers” from the “base layers” as described in my last blog post, we have to make sure the rendering results don’t change. Or, at least, that they do not look too bad. Lets look into that. As a proof-of-concept for the rendering of labels on demand I set up an OpenLayers map with two XYZ tile layers, one for the background and one for the labels. I configured the MapQuest render stack to deliver those two layers, the background layer is stored in the tile store, the label layer is never stored, but always rendered on demand. Nearly everybody setting up an OSM tile server uses either the Apache/mod_tile/renderd or the Apache/mod_tile/Tirex combination. The renderd software has been around for while. When we needed something more flexible two years ago, Frederik Ramm and I created Tirex. To keep the development work needed small and make it easier to switch from renderd, Tirex uses the same Apache/mod_tile frontend as renderd. We had plans to add different frontends, but they never materialized. Apache/mod_tile is difficult to configure and not very flexible, but it does its job well enough. I wrote a proof-of-concept frontend using node.js, but that was never taken up either. In Choosing a Language I have proposed to think about how to render labels in different languages into the tiles on the fly when they are requested. While working with OpenStreetMap or other geodata I often stumble upon interesting (or just pretty) visualization of the data. I have started a collection on my web page (Updated 2018-08-10: Originally this linked to a flickr page). Some of these maps were created “on purpose”, some just appeared on my screen by accident. Maybe it inspires someone to create their own whacky visualizations. Yesterday Frederik Ramm send me a link to this wikipedia page. It contains 73 observations on (mostly obnoxious) behaviour in the Wikipedia and some recommendations how to deal with it. Almost all of that can be translated directly to OpenStreetMap and I recommend that every OSMer read it.